Need a new easy zucchini recipe? 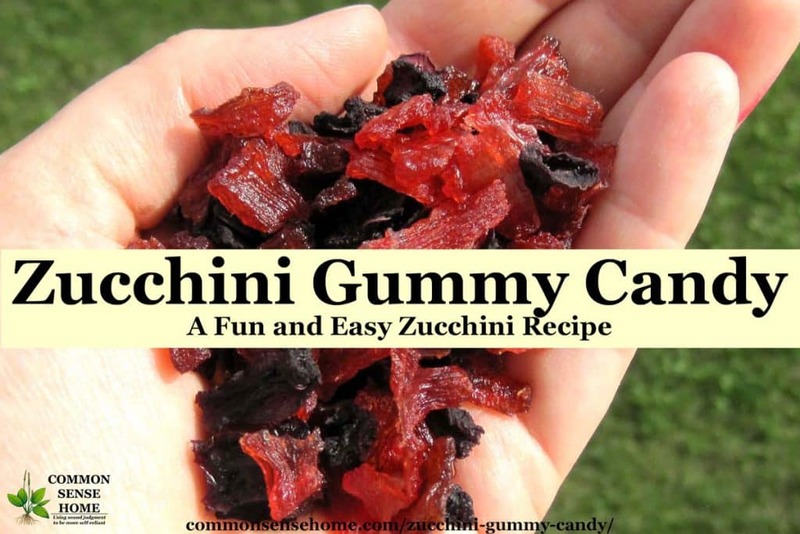 Make some zucchini gummy candy! This zucchini gummy candy recipe is made without jello or pectin tastes like commercial gummy treats with no artificial flavors, colors or refined sugar. I saw a recipe online that made them with drink mix and sugar, and coated them with more drink mix – more sugar and artificial color and flavor than I prefer. So I decided to experiment with a simpler version using fruit juice concentrate. It worked out great! Prepare zucchini. This is a good use for overgrown garden zucchini – just cut around the seed cavity. Place cubed zucchini in a large, nonreactive stockpot. (I use an 8 quart stainless steel stockpot.) Pour in juice concentrate and water. Cook gently until translucent and tender, about 30 minutes. Drain in a colander, spread out on dehydrator sheets so the pieces are not touching. In the photo below I have three flavors (top to bottom): cranberry-raspberry juice concentrate, blueberry juice, and strawberry-kiwi juice concentrate. 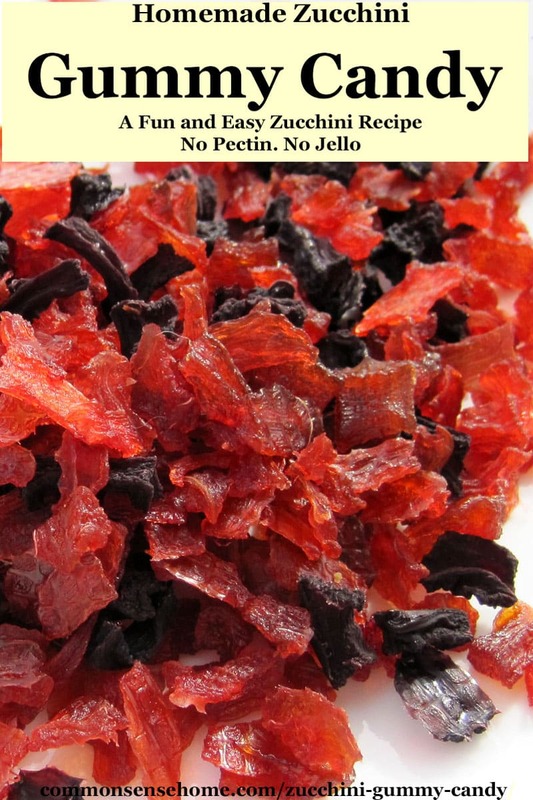 Dehydrate at 135° F for 8-12 hours or until tacky but no longer moist. I usually do mine overnight. As you can see, they shrink dramatically. The dehydrator shown in the photos is my nine tray Excalibur, which I invested in a couple of years ago to keep up with the garden bounty. I also have an older Snackmaster dehydrator, which is a great beginner dehydrator for around $50. The original recipe I saw called for rolling these in powdered lemonade mix to do a sweet/sour gummy, but the juice provides plenty of sweetness for me. I'd suggest storing these in the fridge and eating them within a month, or freezing for longer storage. With the sugar content and water content, it's tough to get them dry enough to ensure long shelf life without cooler temps. 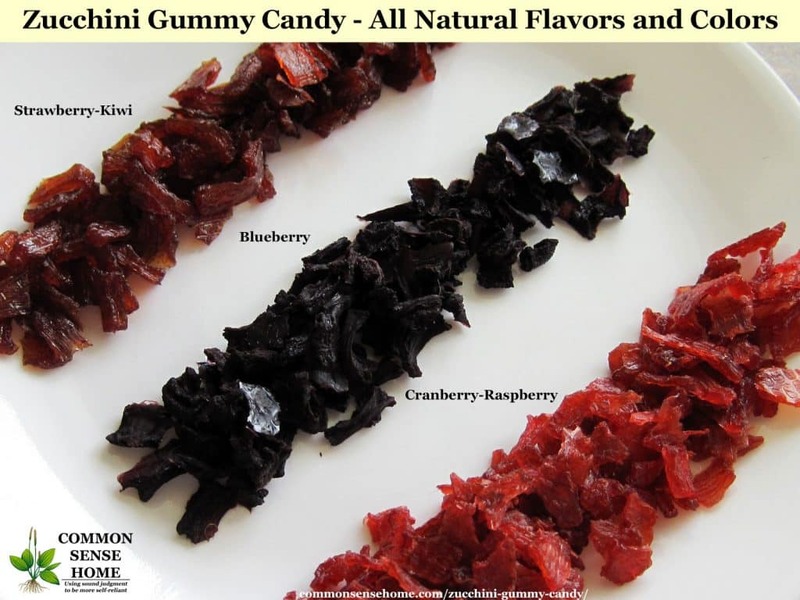 And there you have it – summer squash gummy candy made with no artificial flavors or colors and unsweetened fruit juice. How Many Gummy Candies can you make with one Zucchini? One large zucchini will probably yield 8 cups with careful cutting. To get some different colors for the photos, I tried two different types of juice concentrate and plain blueberry juice (without added water). You may notice that the blueberry gummies are less shiny than the other two. They were also less sweet. The texture and taste is amazingly similar to a commercial gummy candy. I used the leftover juice concentrate to flavor kombucha. 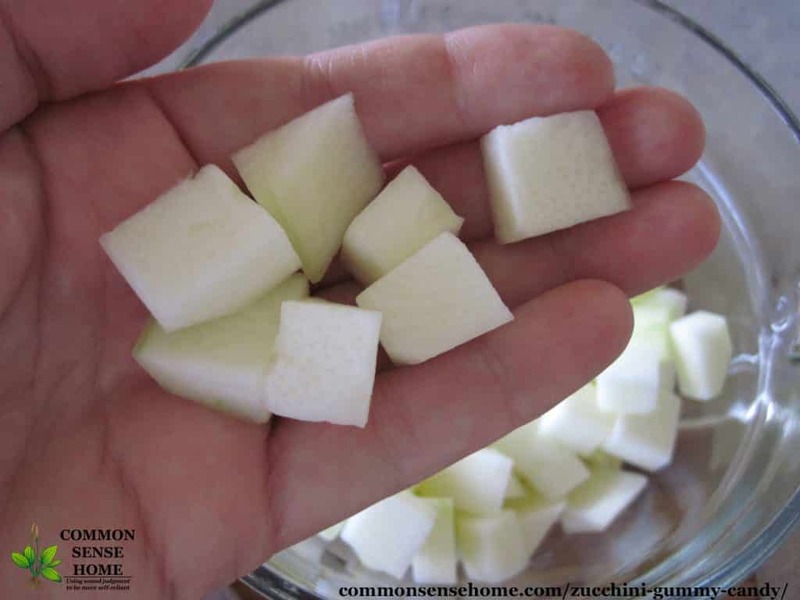 This zucchini gummy candy recipe without jello or pectin tastes like commercial gummy treats with no artificial flavors, colors or refined sugar. Place cubed zucchini in a large, nonreactive stockpot. Pour in juice concentrate and water. Cook gently until translucent and tender, about 30 minutes. 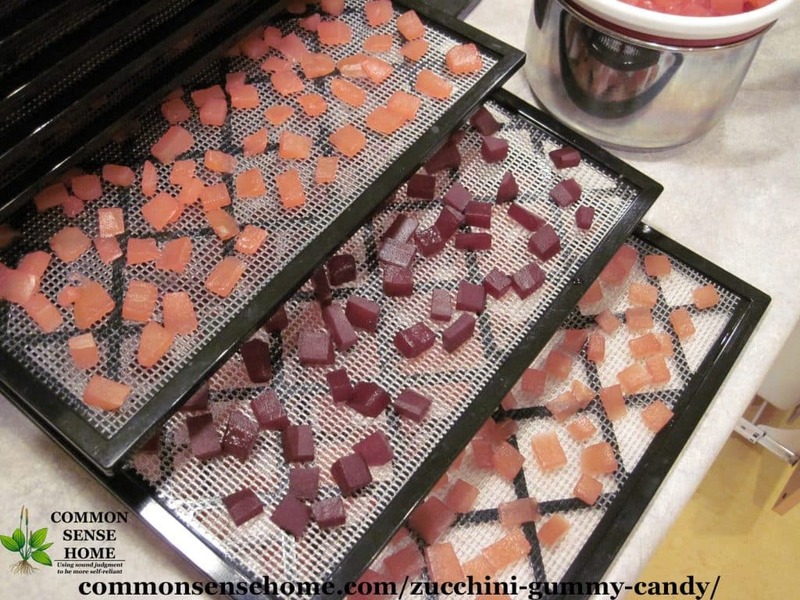 Drain in a colander, spread out on dehydrator sheets so the pieces are not touching. Dehydrate at 135F for 8-12 hours or until tacky but no longer moist. I usually do mine overnight. Enjoy right away or pack for snacking. For longer storage, place in a sealed container in the refrigerator and eat within one month. Makes around 2 cups. This is a good use for overgrown garden zucchini – just cut around the seed cavity. Please take a moment to “Like” or Pin the post if you've enjoyed it, and leave a comment below with your favorite ways to use up a bounty of zucchini or summer squash. 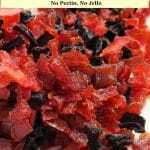 Check out “Home Food Drying – 6 Things You Need to Know to Dehydrate Food at Home” for an assortment of DIY dehydrator options. If you can get your oven cool enough (around 135° F), you could try trying these on cookie sheets, stirring every hour or so until dry. Originally published in 2012, updated in 2014, 2018. That is so awesome! Grape sounds perfect. I wonder if cherry concentrate (from a brew supply) would be good, too. I think any sort of strong flavored concentrate would work great. Something more bland like pear might still taste more like squash. I’m curious if you’re using Paraflexx sheets in your dehydrator for this. I was trying to figure out from the picture. I’m drying tomato leather at this moment on parchment paper, which I’ve never done before, and I’m curious what you use for this situation. Also, I guess if you have any other thoughts on which method is best. I’m using the sheets that were listed on Amazon with the dehydrator, they’re not the Paraflexx. I’ve seen the material referred to as reusable parchment paper before, but it’s fiberglass coated with Teflon. Not great, I know, but I don’t cut on it and I don’t use it at high temps. The American harvest units have plastic inserts for small foods. You could probably dry it on the mesh safely, but some of my pieces were pretty small. I wonder if you could roll them in some citric acid, which is the main component of sour gummies. My autistic son is a very oral child, and I am always trying things to fill his need to chew and not give him crap like licorice all the time. Raisins are his fave, but we will definitely try these. You probably could, but if you’re dealing with autism, large amounts of citric acid may not be a good idea, as it can act as an excitotoxin. Thankfully K is not into sour things, but for another child who it it may work. Or I might try it for myself as I have the occasional craving for sour patch kids. I wonder if a flavored vitamin C drink mix would work, too? I just bought some in bulk from Frontier. I may have to try it. Careful! Citric acid is now made from GMO mold. Some people are linking GMO’s with autism, although no human studies have actually been done, because the companies that hold the patents don’t allow human studies (but, tell us GMO’s are safe. Huh?) You will have to do your own research. Not enough room here. But, you might want to start with the film ‘Genetic Roulette’. Then do some web searches. Here is a link about citric acid and GMO’s. these are great! i made both grape and apple and i did dust them with a store brand lemon drink mix which made them even better! i’m so excited that i now have a way to get my son to eat zucchini! Elaine – glad that you enjoyed them! Elaine – I believe that with the sugar soaking from the fruit juice, further reduction of sugar from cooking and the extended cooking time, the zucchini is serving as a carrier and no longer has real food value as a vegetable and should be treated as a candy treat, not dinner side. Yes – this is true. Even though it’s not using artificial anything, it’s still concentrated sugars. But when you have a sugar craving this would be the way to go! Just found your site and am IN LOVE! So thank you. My question is, would the ratios be the same if using organic bottled grape juice versus concentrate? Thanks! The organic bottled juices I’ve tried have been fairly strong, so I think it would probably work, although I haven’t tried it. Drying will concentrate the flavor, and if that’s not enough you could cook down the juice a bit before cooking the summer squash in it. Say whaaaaaaat? Get out! These are the coolest, most creative thing EVER to do with zucchini! Totally going to give this a try! lol – thanks, Jacquelyn. I wish we’d get some rain so my zucchini would get bigger and I could make some more to try and get prettier pictures. They look funny, but they taste really good! Is there any way to make your own fruit concentrate? If you had juice available, you could always cook it down gently to reduce the volume and concentrate it. I make blueberry concentrate with a pressure cooker. Place 1/2 C water in the pressure cooker, then a steamer basket, then your blueberries. Cook on high pressure for about 1 minute and the berries will be juiced. If you use enough blueberries (about 4 pints) you get a strong juice. Works just as well with chili peppers to make hot sauce. If I manage to have a bounty of blueberries some day, I may try this. Thanks! What a fantastic idea! I’m swimming in zucchini! Thank you! Pinning and sharing on facebook. Thanks, Misty! I always seem to find a few that missed picking the first time around that are perfect for this. What a great way to get the kids to eat some zucchini! The boys are pretty good about eating their veggies, but this turns them into a treat! Has anyone tried cranberry juice? The brighter red ones are cran-raspberry juice. What is a non-reactive pan? Thanks for the recipe! I use heavy duty stainless steel. Glass, ceramic or a coated pan of some sort would be fine. I would not use an uncoated aluminum pan. The aluminum may react with acidity of the fruit juice to produce an “off” flavor. I was wondering if you have ever tried this recipe using yellow squash. I didn’t plant zucchini this year but will soon have an abundance of yellow squash. I also have a 4 year old boy who loves fruit snacks, but I’ve been forbidding them lately, due to all the sugar and artificial additives. I’d love to try it out and use up some yellow squash. Think it would work? 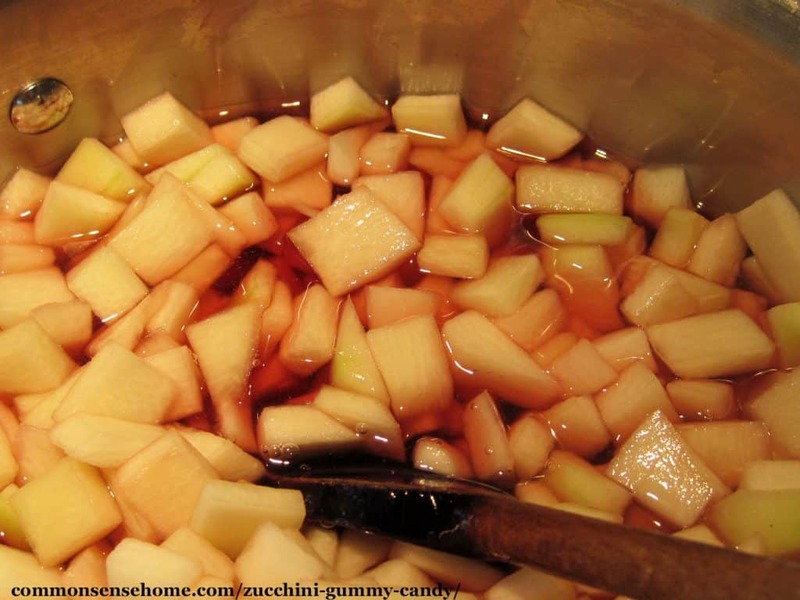 Yes, the first time I made it I used yellow squash, and called it “summer squash gummy candy”, but more people recognize zucchini than the other summer squashes, so when I updated the photos, I changed the title. I made these with pineapple orange concentrate, they are delicious. My husband thought that it was dried pineapple. The next batch I am going to puree in the ninja after they have simmered and pour them out to make leather. I see you have the calorie count down but dont see where it says what a serving is. I would be interested in that as they are addicting and I’m sure I’m eating more then I should. Thanks for such a great recipe. The calorie count is automatically calculated by the recipe plugin, so I suspect it’s not very accurate. I’d enjoy like you would a dried fruit – in moderation. I really want to try making these, but I do not have a dehydrator. Do you have any recommendations for making them using an oven? Thanks! Getting Started with Home Food Drying has information on DIY food dryers. Oh my! Thanks for sharing! Can’t wait to try this recipe! Getting Started with Home Food Drying has information on DIY food dryers. If you can set your oven down cool enough, you could try making these on cookies sheets, stirring every hour or so until dried. What is fruit juice concentrate? Is it that frozen stuff? I don’t think I have ever seen this before. You can find it frozen, bottled or canned. What your looking for is juice with less later, because during the cooking process, quite a bit of water comes out of the summer squash. If you just use juice, it won’t give a strong flavor. Thanks so much I just found this recipe this morning and I am going out now to get all the ingredients to make it. Also I got a dehydrator at a yard sale and there is no manual and the ones I found online don’t tell me what to set the vents on? Do you have any idea? I have a Ronco model 187-04. Thanks for your help and a great recipe! I’ve never worked with a Ronco, but I notice they do have a Contact Us option on the lower left of their website, http://www.ronco.com. 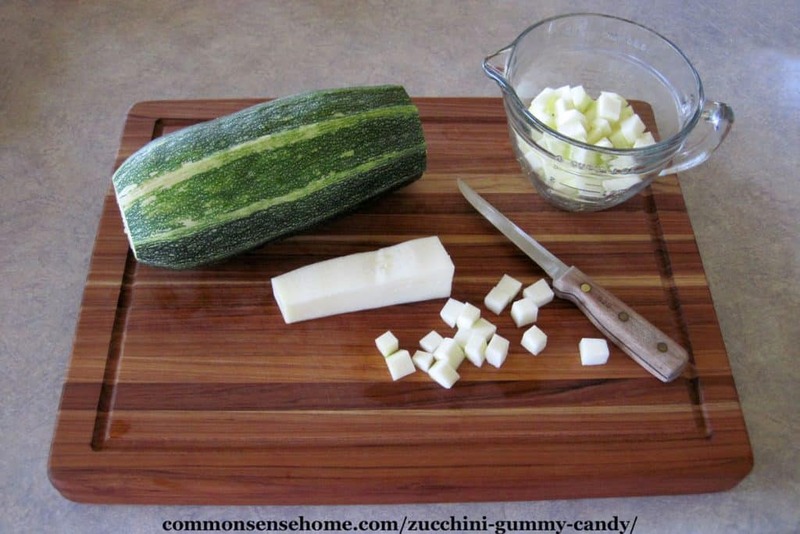 Have you ever tried to cut the zucchini into thin planks and making the gummy that way? My cubes shrunk up into nothing so maybe next time I’ll try it that way. I did cut it in strips the first time I made it, but it didn’t photograph well. Zucchini has a LOT of water in it, so keep that in mind for sizing. The only thing you really want to avoid is a huge mix of sizes, because then some will be dry and some won’t. By the way these were great! I will have to borrow another dehydrator to make multiple batches! My 2 year old loves them! I have a question related. Can you use cucumbers to do this with too? I have an abundance of those and if this works for those too, would be outstanding. I’ve never tried it, but I suspect the texture and flavor might not work out quite as well. Squash tend to be more bland and a little mealy in texture, while cucumber have a more distinct flavor and crunchy texture. There’s only one way to find out for sure, by trying it. If you do, I’d be very curious to see how it worked out for you. Okay these are in the Excalibur right now! I’ve been swimming in squash from my CSA box, I did half zucchini and half pattypan squash, I’m hoping the pattypan works out!!! 🙂 They should be grape flavored, I’ll update when I pull them out tomorrow. Thanks for the recipe I love that this is such a unique idea!! These sound fantastic! What a great idea! We’re a foot deep in snow right now but the zucchini in the summer is always prolific. I’ve let more giant zucchini go to the chickens than I can count. (or the compost) This is a wonderful option. I have a question for you. Do you think that these little gummies would freeze. I’m wondering if I could use a food saver & freeze some while the zucchini is on so that there are some available during these gardenless winter months. Any thoughts? I’m sure they’d freeze fine, and I did end up with part of a batch getting stuffed to the back of the fridge door that I found mid-winter and they were just fine. Just wondering. Can you RE-dehydrate zuchinni? I ask because what if you dehydrate then soak them in a juice concentrate (I put my blueberries in my pressure cooker in a steamer basket with 1/2 C water for 1 minute to make a blueberry juice concentrate) let them soak up the juice then dehydrate them again. Not sure if it’s worth it or not. You think soaking the undried cubes in juice in a vacuum sealed mason jar (foodsave sealer here) might get the juice in without first dehydrating? Vecuum sealing works well this way with marinades for meat an veggies. Just some thoughts for those wanting to stay away from the sugar and koolade. I’m not sure I’m following. You want to dehydrate, then soak, then dehydrate again? Zucchini can be rehydrated, but the texture is never quite the same as fresh. This is a great idea! I usually make gummies with gelatin, but this is a perfect way to use up squash! I never know what to do with it all, and it just keeps growing!! Curious if drying simply on a committee sheet out in the hot summer sun would work the same? I make fruit leather that way, so I assume it could written? Has anyone tried? Our humidity levels are so high most of the time that I don’t try air drying, but if you used small pieces and fruit leather works in your area, the odds are good that it would work. Well color me intrigued…. I’ve pinned this & will be sharing on my FB page too. Hubby is a big fan of dried fruits, and zucchini usually is quite prolific in the garden. Wouldn’t it be great if I could provide him the snack he craves at a mere fraction of the cost using excess from the garden? Thanks for sharing! Loved these! I’ll try them with reduced homegrown orange juice next time. I used pineapple concentrate and took advantage of our heat wave (116F) yesterday to dry these in the sun and they came out fantastic. Very addictive, too! Great recipe, thanks! OMG that’s an amazing idea!!! Thanks so much for sharing this! I don’t see any reason why you wouldn’t be able to do that for extra long storage. They keep very well in the refrigerator, too. I just finished dehydrating marinated zucchini slices with the peel on and when they were finished it occurred to me that they look similar to apple slices. With that my thought my brain started pondering how to make mock apple slices with zucchini. I don’t want to mess with simmering. I have a vacuum marinator, so marinating is an option. In your experience, do you think raw zucchini would take on the flavor of apple juice if it is just marinated? Do you think the addition of a bit of salt would help with the marinating? I also need to consider the best step to add cinnamon – during marinating, or dusted lightly with cinnamon/sugar before dehydrating. If they end up sticky afterwards I plan to dust with arrowroot powder – that always keeps my mandarin orange slices from sticking together. I’ve never used a vacuum marinator, but they seem to work pretty well for infusing flavors on the cooking shows. Why not try a small batch with apple juice and cinnamon in the marinade, and another with apple juice in the marinade and cinnamon sprinkled on right before dehydrating and compare the results? That’s usually what I do when experimenting with new recipes. Thanks for the speedy feedback! I’ll try both, first using plain apple juice as a marinade and then stirring in a little cinnamon to see if it is picked up by the zucchini. This will be a weekend project. I’d be curious to hear your results if you have time to share. Thanks for sharing your experience. I’ve made the zucchini mock apple pie, but had good results without using apple juice. (https://commonsensehome.com/zapple-pie/) I do precook the zucchini with lemon, sugar and spices, so it probably gives similar results. The boys wolfed the last one down and I’m waiting for the zucchini to get bigger. Our plants were hit by hail this year and have had a heck of a time recovering. 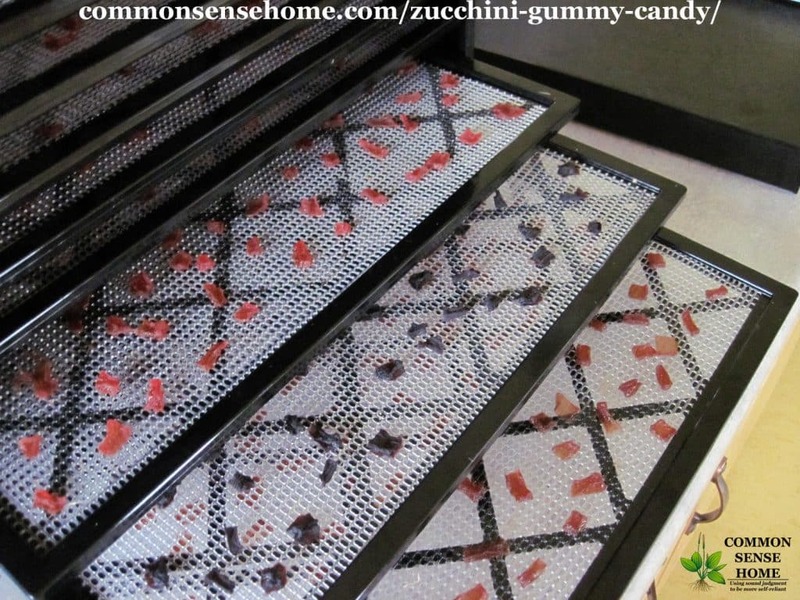 Love this idea – getting out my dehydrator now. wondering if you can re-use the concentrate or do you just throw it out? I used my leftover concentrate to flavor kombucha. You could try using it for another batch, but it’s not likely to give as much flavor because the water from the squash has diluted the concentrate. If you wanted, you could mix it with water to taste and drink it. This is one of the most unique uses for zucchini that I’ve seen yet! I made a delicious mock crisp myself, and that was so incredible that I had to share it on my blog, too. We no longer have zucchini popping up so this will be a fun project next summer- but thank you for the really unique and neat recipe idea!